The Dogtra StB-Hawk has two operating modes: "Run/Point” and "Point Only”. 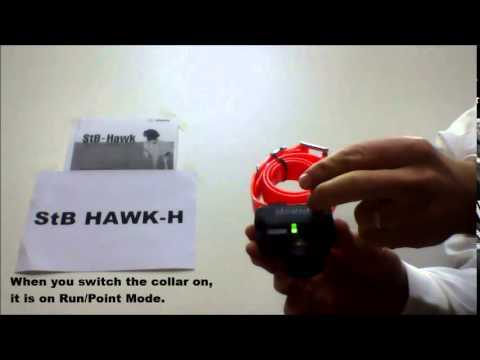 In the ‘Run/Point’ mode, the beeper collar emits a double beep every 7 seconds while the dog is moving. Then, it will change automatically to a beep sound every 2 seconds when the dog is on point. In the ‘Point Only’ mode, the beeper collar remains silent when the dog is moving. When the dog goes on point, the beeper collar will emit a hawk sound every 2 seconds until the dog starts moving again. 2 modes: ‘Run/Point’, ‘Point only’. 2-hour rapid charge Lithium Polymer battery. Weight of the collar: 180 g.